Reason for Reading: It’s always fun to see what standards previous generations had to live up to in comparison to today. I think I heard about the book on BookCrazy. 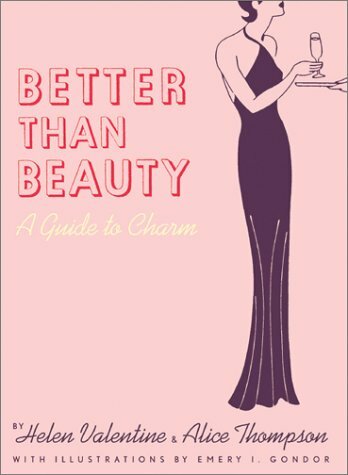 Synopsis: Better Than Beauty is just what the subtitle says, a guide to charm. It begins with personal hygiene (you have to start somewhere, right? ), and strolls through exercise, diet, and fashion before moving into the more obvious areas of social interaction – meeting people, parties, and awkward situations, for example. Why you should read this book: If you dig campiness, you’ll love the wildly out-of-date information in this book – it seems so ridiculous today that it’s hilarious. The second half of the book, on social situations, is a bit more useful. The advice is simple, but sometimes we could all use a reminder it’s not polite to complain about one friend to another friend, or that expressing a sincere ‘thank you’ is always a good idea. A positive aspect of the book is that it focuses on helping yourself for your own sake, rather than to impress the people around you. Why you should avoid this book: If you’re not into the retro aspect of the book, you’d be better off finding a modern book of etiquette that addresses life in the twenty-first century. Sure, some of the advice really is timeless, but a lot of it would make women cringe in horror at expectations that seem out of touch with today’s lifestyle, such as, “Mrs. Ainsworth, who has a small baby and must have her hands in water frequently, needs fresh [nail]polish every other day.” Younger generations will be lifting their eybrows over hearing that they should wash their hair with a bar of soap and similar advice that would be laughed right out of Cosmo magazine. There’s a lot of ground covered, so you won’t find much in the way of specific examples, just short and snappy sentences before moving on to the next topic. For most people, this is really more the sort of book you would borrow from the library rather than something you should invest in buying in order to have it handy for reference. Once in a lifetime you may meet that rare person whose face and appearance you forgot, but whose charm remains indelible. It doesn’t happen often. What we see usually becomes a vital part of our impression of people, our brain picture. Never be afraid of doing the wrong thing. Whatever is courteous and pleasant is bound to be right. And, once and forever, discard the notion that people are watching you to see whether or not you are being correct. Do you watch others and pick flaws in their behavior? Of course you don’t. Who cares? You can forget the Do’s and Don’ts of etiquette, if you will set up this simple standard…the only bad manners are those which are unkind or which contribute to another person’s discomfort. Before you can talk, you must have something to talk about. Does this seem too obvious to need statement? Not when you hear the aimless chatter that floats around. What do these people read, what do they think about? Do they think? Are they aware that this is a fast-changing world? It is difficult to give a recipe for successful conversation. But it would certainly include three fundamentals. Assemble good ingredients, mix and spice with your own thinking, and serve attractively. Also by this author: Better Than Beauty was Valentine’s and Thompson’s only book. Fun tidbit: Emery I. Gondor, who did the tongue-in-cheek illustrations for this book, as well as for books like You Can Help Your Country Win, was also a child psychologist. Would I read more by this author? Not an option in this case, obviously.